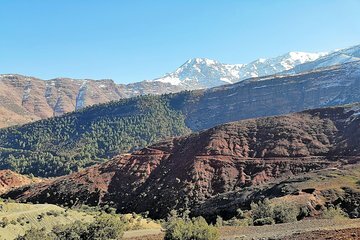 Experience the mountain scenery and Berber culture of Morocco’s High Atlas mountains on an 8-hour tour from Marrakech. Travel into the Imlil Valley by air-conditioned minivan or 4x4, and visit an argan oil co-operative and the town of Asni. On arrival at Imlil village, enjoy a scenic 1.5-hour trek through the hills with a local guide and finish with lunch at a Berber family home. Includes lunch, entrance fees, and Marrakech hotel pickup and drop-off.